Burnaby dental group is a modern, high tech state of art dental facility where dental care is customized to improve overall oral health of an individual. 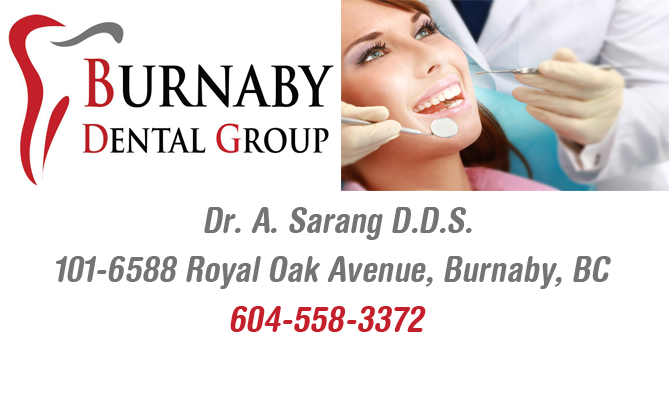 Dr. Sarang and his expert team’s effort starts from patient education and awareness, prevention of gum disease and cavities to smile enhancement and cosmetic dentistry in Burnaby. Dr. Sarang and his knowledgeable team provide a complete range of cosmetic services like metal free crowns, veneers, bridges and implant crowns in a soothing and relaxing environment. Burnaby Dental Group also offers services in Laser Dentistry. Laser Dentistry boasts benefits like less discomfort, painless procedures, faster healing, minimal or no anesthesia, and reduced bleeding. Lasers can be used for soft tissue, periodontal issues and laser whitening procedures. Dr. Sarang uses laser dentistry where it is required in soft tissue and periodontal procedures.